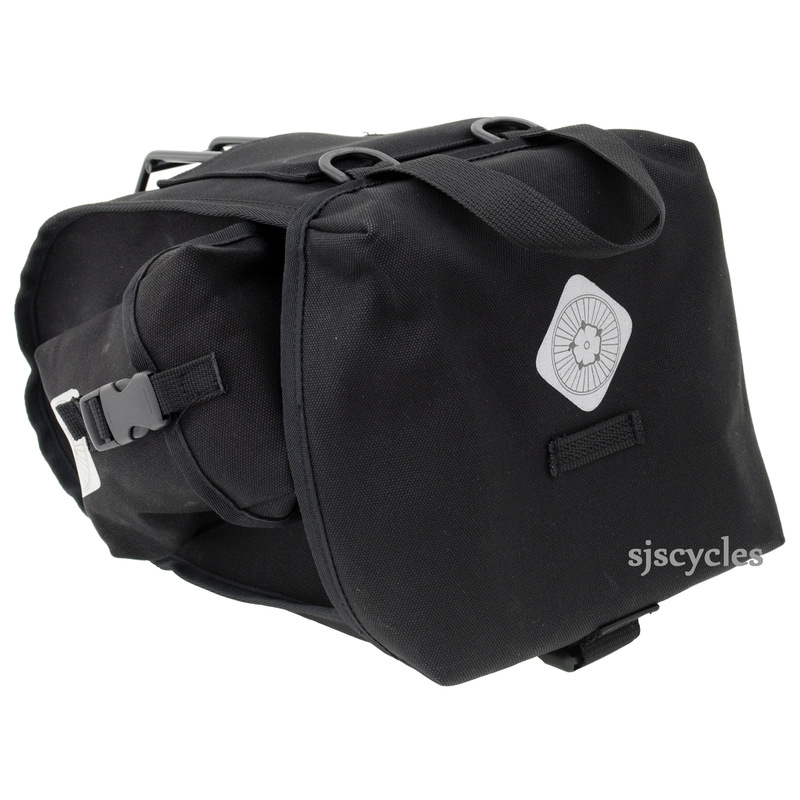 Made from 100% waterproof cotton duck these tough & reliable bags are built for every day use but are also ideal for audax, club rides or hosteling. Fixing is with the Carradice SQR System to fit to seatposts upto a diameter of 32mm (standard version). All Carradice bags come with a lifetime guarantee against defective materials & workmanship. The bag is great. Been using it for a few weeks and it feels like it will last a long time. Only downside is that the pockets on the side are a bit loose (as others have pointed out). This bag is the ideal size for short to medium touring trips. Three of us used this bag over 10 days and put it through the worst you could imagine. The quality is great, the mount is solid and the ease of removal is handy. As with all of the othe reviews mention, there is a gap between the flaps on the side pockets that allows small or thin objects to fall out. Whilst not a deal breaker this is really annoying that it hasn't been fixed. Ideal for a weekend of hostel touring with 100 mile days. Experienced heavy weather during trip. Bag was great, very practical. Used it on carbon seat post with some tape. No problems. Easily took flip flops, spare clothes and washing kit plus typical spares, 1st aid, and a few other small items. Side clips could close over more securely, but nothing fell out. I bought this for my recent 9 day LEJOG and I was not disappointed. It attaches easily to the seatpost and gave me enough room to carry off bike shoes, spare cycling gear, 2 t shirts, long shorts, wash kit, thin fleece and route maps in the main compartment. In the side pockets I had 2 spare tubes, spare tyre and CO2 canisters. I had one day of bad weather and everything was bone dry! I agree with others that the straps on the side pockets could be sewn in a better place. You do need to remember to pack heavier items at the bottom of the bag to keep the weight close to the seatpost. The bag is very well made and so far it's been 100% waterproof in the few hours of rain I've used the bag and hold a lot of items. I have tools in one of the side pockets and a lightweight waterproof jacket in the other. As an idea of the size of the main compartment I can hold a Gore windproof jacket, long sleeve baselayer top mini pump, gloves, glasses, a lunch box and a few pieces of fruit or a full size cycle helmet. As the other reviewer as pointed out, the straps on the side pockets seem to be sewn on a little too high which leaves a small gap when closed and tightened fully so small items might fall out although so far none of mine has so I dont think it's a major problem, just take care with smaller vaulable items though just in case. the main compartment has a nylon bag sewn into place with a drawstring you can close to make it more secure and a small velcro pocket inside to put your phone in. Do not overtighten the brackets when attaching it to your seat tube as they have a tendancy to snap (I made this mistake but a quick email to Carradice and they sent me a pair of replacement brackets free of charge through the post). Also put a small amount of old inner tube on your seat tube before attaching the bracket so not to scratch your seat tube plus it give a better grip. Overall I'm very happy with the SQR Tour Bag and I've actually ordered a Carradice Barley also. I would just like to point out I'm extremely happy with the service from SJScycles and will in future be ordering all my items from here, great price, quick delivery and great customer service. Overall the bag is very good. 1..The straps on the side pockets do not appear to have been sewn on in the correct place, so that the adjustable clip does not close the lid tight. Small items can fall out. 2..Some reviewers have said that the back of their legs touch the bag. Mind do as well, but not a problem.. I need to move the seat forward a little as long as it doesn't mess up the correct seating to peddles metrics. 3..On the bottom of the bag the strip of plastic protection acting as a mud/rain guard is not full width which would have made it easier to clean. Otherwise the bag is very strong and fits very well on the bike. Not tested in heavy rain yet. Good buy just annoyed that the side clips are positioned wrong. Can I use this with Canondale Synapse seatpost? My Synapse has a 25.4 carbon seatpost. Would the fixing work with this? Thank you for your enquiry. We wouldnt recommend using this with a carbon seat post due to the clamp fitting system damaging the post due to how the bracket fits & then the weight of the bag itself. Your best option would be to contact the manufacturer of the seat post to see what they advise. Hi, are these the older version or do they have the red "Super C" badge? These are the newest version with the red badge. This bag would not be compatible with that rack as this bag has its own frame built in and require its own seatpost fixing (which is supplied). The SQR bag is designed to be fitted without the need for an additional rack.